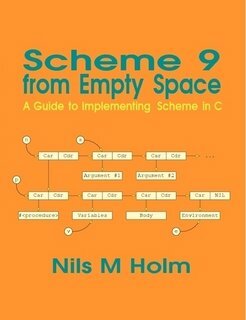 This book is a thorough guide of the internals of the scheme system with the same name. It provides a detailed account of every aspect of a non-trivial interpreter, from memory management, through the implementation of primitives, all the way up to the user-level forms and functions. This is a very educational book for anyone interested in becoming more familiar with C or Scheme programming, language implementations, or just learning the in-and-outs of a moderately-sized code base. The book is not exactly forbeginners, because the better part of it consists of code. Although the code is very straight-forward,some familiarity with both C and Scheme is required to follow it. Nils M. Holm is attracted by anything that is beautiful: math, nature, little insects, and the bright sun rays that fill the sky in the summer days, but most of all by the fragile reflection of empathy and sensitivity in the eyes of beings that are similar to himself.